14K vs 18K Gold: Which Karat is Better? Not all gold is created equal. In its pure form, gold is exceedingly soft and malleable: properties that do not allow created jewelry to stand up well to daily wear. To solve this problem, jewelers alloy gold with other metals to increase its strength and resistance. This is where 14-karat and 18-karat gold come into play. It’s a good idea to learn about the important differences between the two so that you can make the best choice for your needs. 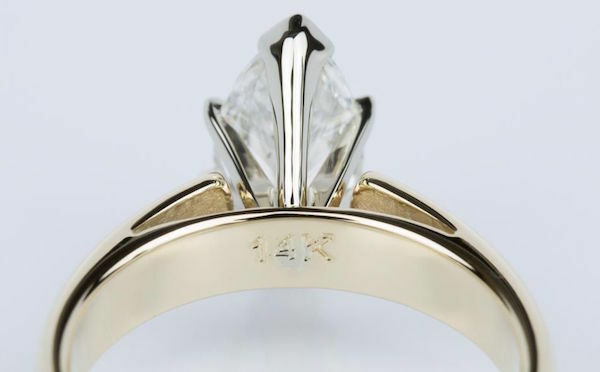 K stands for karat (not to be confused with carat, which is the weight measure for gemstones) and refers to the percentage of gold in an alloy. 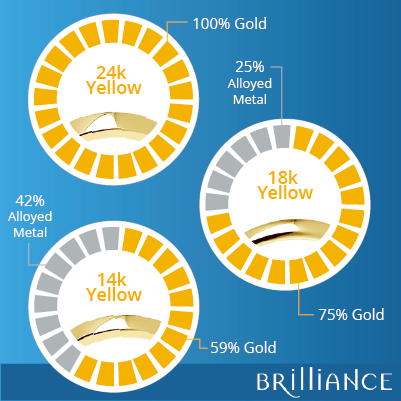 To illustrate: 24K gold is 100% pure, 18K contains 75% gold and 25% alloyed metals, and 14K is 58% gold and 42% alloyed metals. Simply put, the 14-karat and 18-karat system makes it easier for the average person to determine the amount of pure gold in a piece. How can you tell the difference with your gold jewelry on your own? Jewelers usually engrave the karat on an inconspicuous part of the jewelry, such as on the clasp of bracelets and necklaces, or on the inner band of rings. Because of its greater percentage of gold, an 18-karat piece will fetch a higher price than one of 14-karat gold. However, in some cases, monetary value alone does not influence purchasing decisions. Others take history, circumstance, or sentimental value into consideration, too. Some also consider the look of the gold, as the higher the karat of the gold, the more yellow it appears. 18-karat yellow gold has a deeper yellow hue than 14-karat, 14K-karat white gold has a stronger white color than 18-karat, 14-karat rose gold is more pink than 18K, and so on. 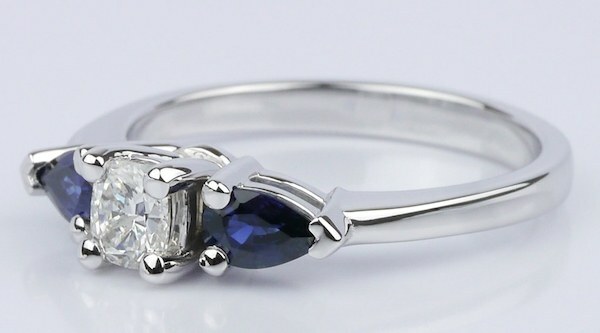 Sometimes 14K is the better complement to the desired gems for the piece or just has a more appealing look. 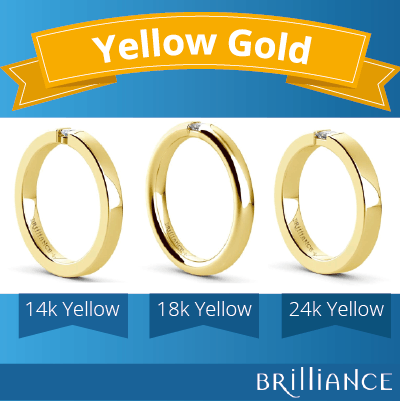 Because of its higher percentage of alloyed metals, 14k gold offers more resistance to wear and tear. Thus, it is ideal for everyday use, and is the most popular choice for engagement rings and simple wedding bands. Those with active lifestyles should definitely consider getting 14K gold jewelry because it holds up better in sports, manual labor, and other rigorous, regular activities. 18K gold jewelry is softer than 14K, and is therefore typically considered a special occasion piece. You can expect to see more of 18K gold pieces at social events or on red carpets. Karat desirability varies from region to region. In the US, 14-karat gold is more dominant in the jewelry industry. Meanwhile, 18-karat gold is more popular in Europe and Asia. 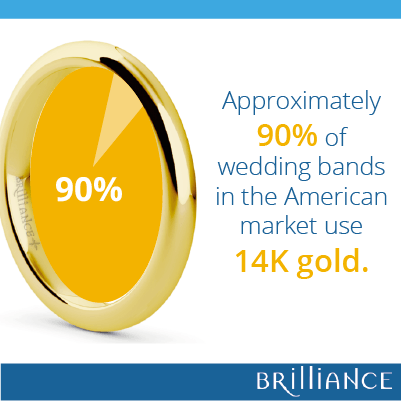 Approximately 90% of wedding bands in the American market use 14K gold. As with most things, there are positives and negatives to the different gold karats. It is important to know what you want out of a piece so that you can pick the karat that is right for you.